Health Dynamics students get to enjoy a variety of activities during their activity sessions. This fall, Hope College enters the 39th year of its KIN 140 – Health Dynamics program. This required course, often taken during a student’s freshman year, focuses on various wellness principles, such as exercise, proper diet, and stress management. The two credit course is a staple of Hope’s general education curriculum and involves one hour of lecture and two hours of exercise per week. The type of exercise varies between aerobic (running, walking, swimming), resistance (weight training), flexibility (stretching), and game/recreation-type activities. Dr. Richard Peterson, the first Health Dynamics program director, stated that the goal of the course was not simply to educate students, but to instill in them an “intrinsic” motivation towards exercise. Nearly forty years later this remains the primary goal of Health Dynamics. Health Dynamics began in the 1970s in an effort to cultivate a positive attitude towards health and fitness among Hope students. Dr. Richard Peterson, the first Health Dynamics program director, stated that the goal of the course was not simply to educate students, but to instill in them an “intrinsic” motivation towards exercise. Nearly forty years later this remains the primary goal of Health Dynamics. Health research continues to illustrate the important role exercise plays in the prevention of many chronic diseases. Despite this growing body of research the physical activity (PA) levels of Americans have declined sharply in recent years. Currently, only 20% of Americans are meeting the national PA recommendations. This decline in PA coincides with more and more colleges dropping their physical education requirements. 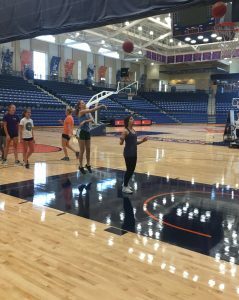 In fact, according to a 2013 study from Oregon State, only 40% of colleges still require a physical education course as part of their degree programs. At Hope, it’s understood that promoting and instilling strong PA habits during these transformative years is critical. 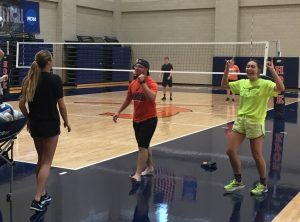 Students celebrating during a volleyball game in class. “As educators at a liberal arts college, we recognize the unique ability we have to influence our students’ lives. As such, we believe that Health Dynamics has the capability to increase not just our students’ knowledge, but also their enjoyment of exercise. This is critically important, as both knowledge and enjoyment of exercise are strong predictors of future PA behaviors and adherence.” says Dr. Brian Rider, current director of the health dynamics program at Hope. According to Dr. Rider, the Health Dynamics program is utilizing new technology and undergoing some exciting changes. Hope’s steadfast commitment to its students’ well-being is as strong today as it was when the college was founded. 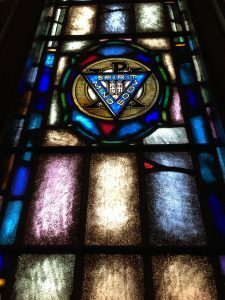 This window located on the south west corner of Dimnent Chapel indicates the college’s long standing commitment to the development of the Body, Mind, Spirit. It was a gift from the Class of 1907. Hope’s steadfast commitment to its students’ well-being is as strong today as it was when the college was founded. It is our desire that every student sees the value in what they’ve learned both inside and outside of the Health Dynamics’ classroom and that this course helps them continue on (or in many cases begin) their own personal journey towards health, wellness, and positive life-long fitness habits. Health Dynamics has been, and will remain, a key component of Hope’s mission of challenging the mind, body and spirit.The kinesiology department and all of the Health Dynamic instructors understand the importance of such a class to Hope College and support / encourage good stewardship of our physical bodies.